Tascam's AK-DR11C accessory package helps you integrate your handheld Tascam recorder with your video camera for capturing high-quality sound. The furry windscreen sits atop your recorder and ensures your take won't be ruined by wind noise when you're shooting outdoors. The included attenuator cable lets you feed audio signals from your recorder directly to the camera's line input without overdriving and distorting the signal. 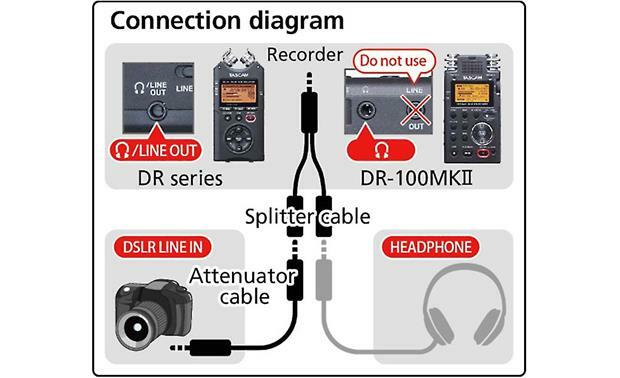 If your recorder connects to your camera through its headphone output, the splitter cable will let you make that connection and still monitor audio through headphones. The shoe adapter lets you mount your handheld recorder to the shoe of your DSLR. And the included soft carry case keeps all of your accessories in one place, ready for use. Compatible Tascam recorders include the DR-05, DR-07MKII, DR-22WL, DR-40, and DR-100MKII. Overview: The TASCAM DR Series Accessory Pack (AK-DR11C) is designed to integrate a TASCAM portable recorder with a DSLR camera. Because of its compact size, TASCAM portable recorders can be mounted on the accessory shoe of many of today's DSLRs. 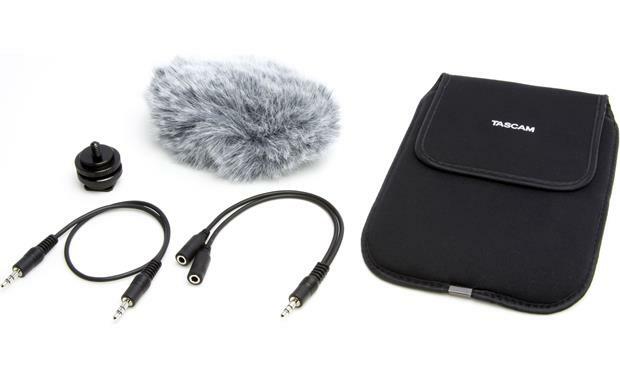 The accessory pack includes a hot shoe mounting adapter, connecting cables, furry windscreen, and a soft storage pouch. Compatibility: The AK-DR11C accessory pack is designed for use with the following TASCAM DR-series recorders: DR-05, DR-07MKII, DR-22WL, DR-40, and DR-100MKII. Mount Adapter: The camera shoe-mount adapter will allow you to mount the handheld recorder to the accessory shoe of a DSLR camera or video camera. It has a 1/4" threaded stud that will accommodate the tripod socket found on the bottom of a DR-series recorder. On the other side is a standard sized flash mounting foot that fits into the camera's accessory shoe. The 1/4" stud and mounting foot both have thumb screws for tightening the adapter to the recorder or camera. Furry Windscreen: If you are recording audio or shooting video outdoors, any amount of wind can cause noise in a microphone. The lightweight (0.76 ounces) furry windscreen covers the microphones of a DR-series portable recorder for noise-free recording. It works with microphones in both XY and AB positions. The furry windscreen has an elastic band that holds it in place over the recorder's microphones. Attenuator Cable: The DR-series recorders have a higher output signal than most DSLRs and video cameras are designed to accept. 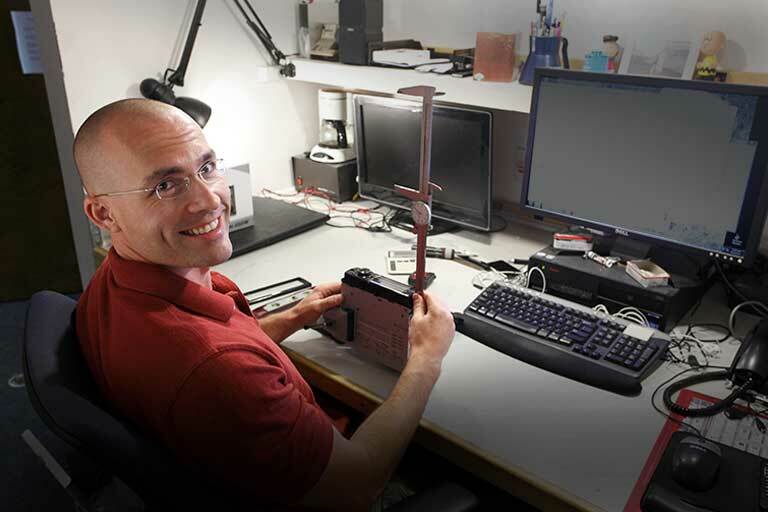 Inputting a high-level signal directly into the camera would cause distortion and degrade the audio. The 15" attenuator cable has 3.5mm male plugs on both ends, and lowers the signal strength of the recorder output to an optimum input level for the camera. Note: If the recorder has separate headphone and line level outputs, only the headphone output should be used. Splitter Cable: Because the Attenuator Cable uses the recorder's headphone output, you will need to use the Splitter Cable if you wish to monitor the incoming audio with headphones. The 9" Splitter Cable provides one 3.5mm female output for headphones and one output for the Attenuator Cable. The other end of the Splitter Cable is a male 3.5mm plug that connects to the recorder. Storage Case: The soft cloth storage case is designed to hold a TASCAM DR-series recorder, protecting it from dust and moisture. It has a large flap closure with a hook-and-loop fastener. Mount Adapter: Diameter: 1.072" Height: 1.179"
Furry Windscreen: Width: 5.118" Height: 3.543" Depth: 1.575"
Storage Case: Width: 5.118" Height: 7.874" Depth: 0.787"
Searches related to the Tascam AK-DR11C Filmmaking Accessory Package For select Tascam handheld digital recorders.